It’s writing filled both with humanity and a sense of place, descriptive in a way that refuses to ignore who and what we pass by everyday but fail to see. 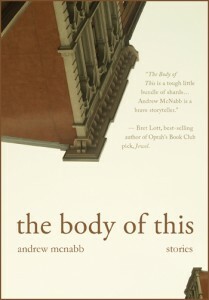 The setting for most of the often very brief short stories in McNabb’s collection (published in paperback by Warren Machine Company) is Portland, Maine – and the old portion of Portland. The people whose minds McNabb has invaded are God’s people – church-going, Catholic people – and for the most part believable and real. Meet Lydia, the immigrant trying to dress well and fit in at high school. There’s Frank, the lonely senior citizen serving food to the needy in the church basement who feels misunderstood. And that young couple who decorated the baby’s room in anticipation of their first child only to…no, you’d better read that one yourself. McNabb writes some pretty weird stuff, too. When someone can bring together both reality and a sense of imagination the way he can, a reader has to wonder why he stoops to vulgarity at times. I say unnecessary because the empathy McNabb has for what some might call the least of God’s people is truly eye-opening, a blessing for his readers. And the first-person story about a lottery winner – “It’s What It Feels Like” – is a marvelously-told piece of work that’s more about marriage – and the sometimes one-sideness of marriage – than about winning millions. Is it what it looks like? Or is it what it feels like? What are all those people thinking, the ones we live with, the ones we work with and study with and volunteer with – and love?